I like Dove. I like the "Promises" line. Truth be told, the milk chocolate Promises are a candy dish staple in my house. So naturally, I snapped up the Peppermint Bark Promises. This Promise is layered, with a base of dark chocolate, topped by white chocolate that is studded with bits of peppermint hard candy. It was disappointing when I opened the bag and there was pretty much no hint, scent-wise, that there was peppermint goodness hidden within. Even once unwrapped, the Promises themselves smell more like dark chocolate than anything else. 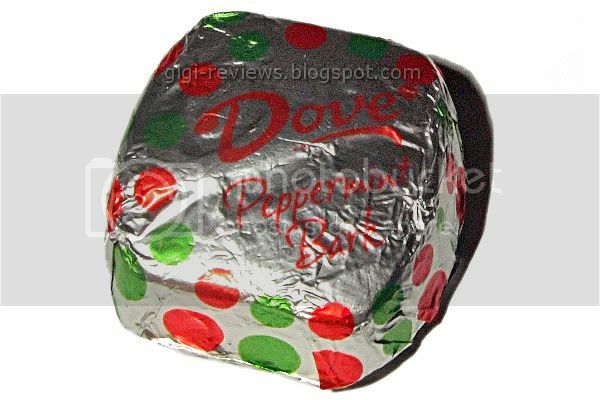 When you bite into the bite-sized square, the chocolate is smooth, but there is some crunch provided by the peppermint nibs. Biting into each layer separately, starting with the white chocolate top, the white chocolate is smooth and creamy. It has a very milky quality that I liked. 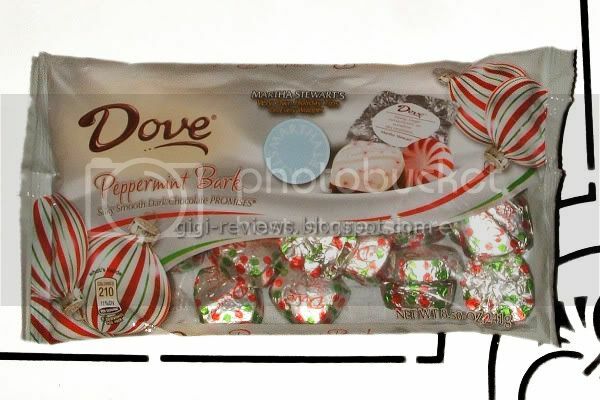 And of course since this is where the peppermint pieces live, it has the added crunchy texture. The mint also makes this portion a little cooler on the tongue. The dark chocolate layer is standard Dove Dark. It's more like a really good semi-sweet chocolate chip than a true dark. It's smooth and has an outstanding melt. It's not as intense as some of the top of the line darks out there, but it has a woodsy, coffee-like taste that keeps it interesting. The two layers combined have a flavor I can best describe as slightly mint-flavored milk chocolate. Overall I liked these Promises. I just found myself wishing the mint were stronger. But if you like your mint subtle rather than assertive, this may be the candy for you. Anyway, instead of that, these promises feature holiday tips from Martha Stewart. And what are some of Martha's nuggets of wisdom? "String lights on border edges to line your walkways"
"Dress packages in candy stripes for a sweet presentation"
"Use fishing line to hang wreaths"
"Glittered lemons make cheerful center pieces"
What? Are you telling me you haven't turned your 75 square foot apartment balcony into a fully operational, self-sustaining .001721763 of an acre organic farm? You guys are seriously just not trying! 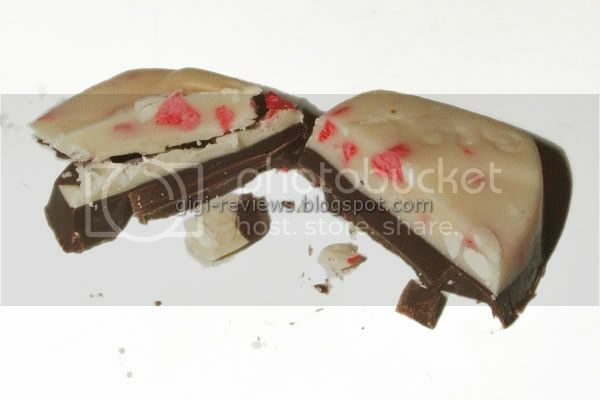 Anyway, the Dove Peppermint Bark Promises weren't bad. They weren't special enough to buy again, but yeah, I'll probably finish the bag. Be sure to check out Cybele's review here. I think she liked them more than I did. I got "Use gumdrops to make festive snowman pops." I did not read that last word as pops the first time through either. Have you ever tried Hershey's peppermint candy cane kisses? Those might just be the minty taste you're looking for. 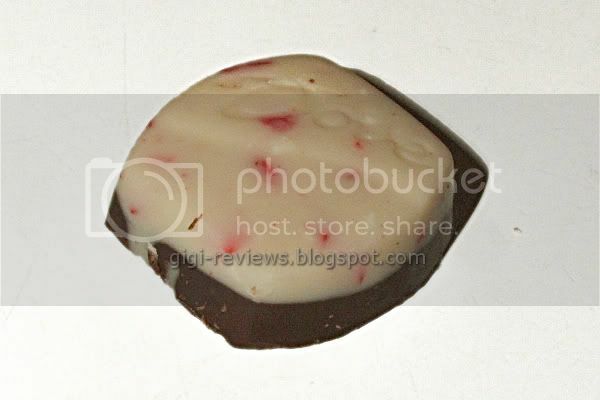 Katrina: I did try the Peppermint Kisses a few years ago- the first year they replaced the white chocolate with the currant "confection" base they are using now. I actually did like them- now I am wondering I haven't had them in so long.